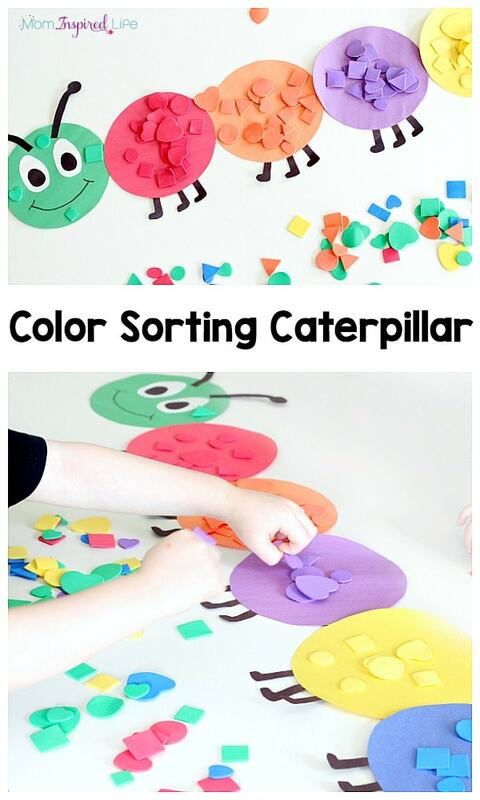 This shape and color sorting caterpillar is a great way for preschoolers to practice color recognition and shape identification. 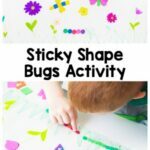 It’s a fun spring activity for kids! 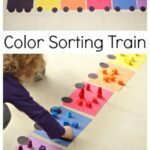 My kids loved the color sorting train activity we did a few months ago and the activity has been SUPER popular with my readers, so I thought it would be a great idea to come up with another version for spring. I immediately thought a caterpillar would work perfectly! 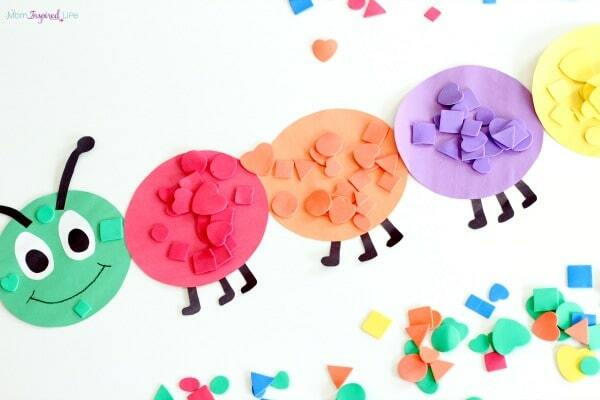 This is very easy to make because all you need are large colored circles and foam shapes. I even saved the pieces so we could set it up again. 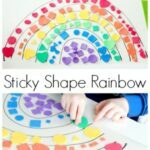 Use a large bowl or something similar to trace a circle on each sheet of colored construction paper – green, red, blue, yellow, orange and purple. Cut them out. Cut two eyes from the sheet of white paper and two black pupils to go on the eyes. Cut the antennae from the black paper. 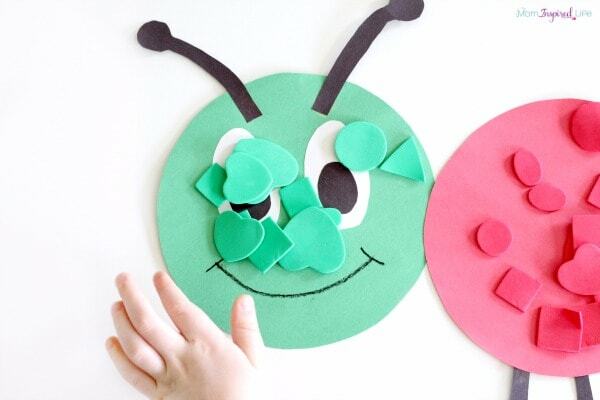 Glue the eyes and antennae on one of the colored circles. Tape the head and all of the rest of the circles to the surface you will be working on with painter’s tape. 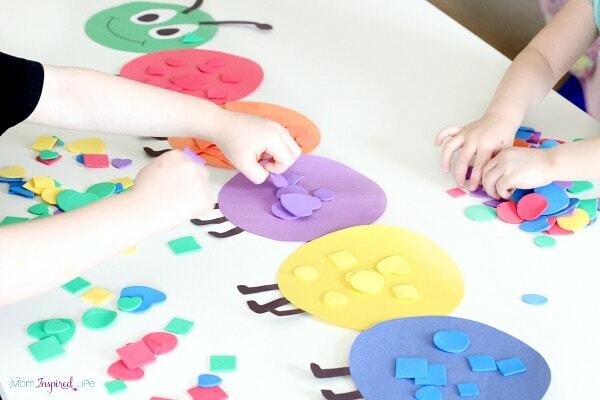 I put down a bunch of handfuls of foam shapes on the table next to the caterpillar and let my kids go to town sorting them to the corresponding colored circles. My toddler thoroughly enjoyed sorting them out. It was perfect for her because it was self-correcting. 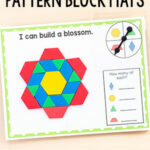 As soon as she placed a shape on the wrong color, she was able to see that it didn’t match and move it to another color. 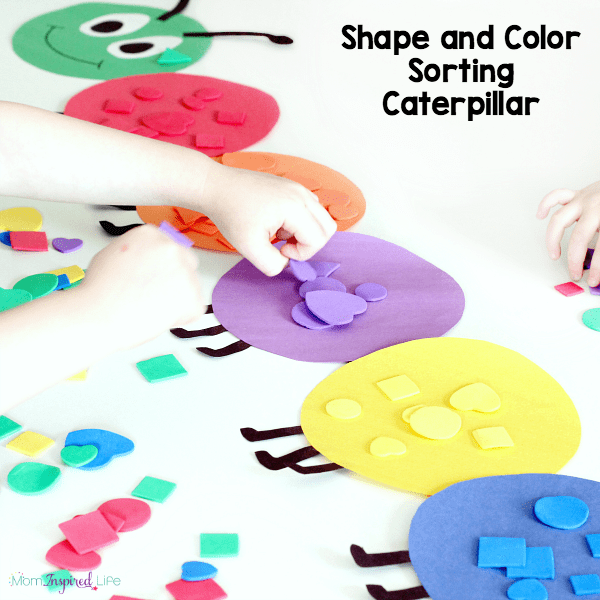 After a while, they cleared the shapes off of the caterpillar and practiced sorting them by shape. 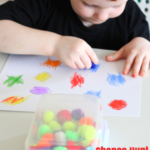 They also practiced counting because my preschooler wanted to see which color had the most shapes on it. I saved the caterpillar because I have a few more ideas I plan to use it for. Stay tuned! 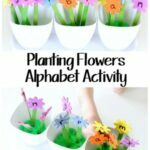 Here are some more spring activities for kids!